[Northern Colorado Beer News] - Happy First Full Day of Summer! Today is a day where the sunlight lasts its longest in the northern hemisphere - a perfect reason to stay out later and enjoy a Colorado craft beer. There's a good reason to participate in tomorrow's Bike To Work Day - free or discounted beers! Fermentedly Challenged knows where you might go to enjoy a cold one. Here's what's happening around the Northern Colorado craft beer scene today on the Summer Solstice, Tuesday, June 21st, 2016. If you aren't reading this article on FermentedlyChallenged.com, you don't know what you're missing. Also be sure to follow Fermentedly Challenged on Facebook too. Picture of the Day comes from: Grimm Brothers Brewhouse in Loveland, CO.
300 Suns Brewing will be participating in the Bank N Benefit: Down on the Farm this Saturday, June 25th at Coyote Ridge Farm (7217 Coyote Trail, Longmont, CO). Join in for some live bluegrass music, craft beer from 300 Suns, farm fresh food, games, and a silent auction on a gorgeous 60 acre farm. There will be a private dog park with swimming holes for pups too. 300 Suns Brewing is located at: 335 1st Avenue, Unit C, Longmont, CO.
BJ's Restaurant and Brewhouse is hosting FREE PIZOOKIE DAY today, June 21st. Stop in and order food worth $9.95 or more and you'll receive a free Pizookie (think pizza cookie with ice cream). Pair that with your favorite BJ's craft beer. Located at: 1690 28th Street, Boulder, CO.
Bootstrap Brewing Company is turning 4 Years Old this week and they've got several things lined up. Trivia night is tonight. For Wednesday, June 22nd, if you ride your bike to the brewery that day you'll get $1 off pints. Just show Brian your bike helmet when you come in. Plus Euchre night on Wednesday too. Boulder Beer Company has put its Hazed Hoppy Session Ale into cans for this summer. These limited edition cans are only available during the summer. Enjoy this hoppy brew made with Nugget, Willamette, Crystal and Centennial hops. Chill one down and enjoy on these hot summer days and #GetHazed. Located at: 2880 Wilderness Place, Boulder, CO.
BRU handbuilt ales & eats is turning 4 years old and the celebration happens this Saturday, June 25th starting at the open. There will be 4 special beer pourings at 1:30pm (Belgian Quad), 2:30pm (Imperial Saison), 3:30pm (Imperial IPL) and 4:30pm (Maibock). Live music will play from 1-4pm. Come for the beer and grab some food while you're there. Located at: 5290 Arapahoe Avenue, Boulder, CO.
Front Range Brewing Company will host Open Mic Night tonight and every Tuesday night from 7pm to 9pm in the taproom. Ask either Torianna or Barb and they'll reserve a spot for you in the line-up. If you perform you'll receive a free beer. Located at: 400 W South Boulder Road, Ste 1650, Lafayette, CO.
Industrial Revolution Brewing Company is hosting Brew Ha HA Comedy Night this Saturday, June 25th from 7pm featuring comedians Vincent Vigil, Dylan Aames, Stephen Agyei and the host El Comico. Beer and laughs - what could be better? Located at: 285 Cheeseman Street, Erie, CO.
Left Hand Brewing Company announced today that they will be releasing to new 22oz bomber beers later this month - look for their Pride Runs Deep IPA and Rye on the Prize Imperial Red Rye Ale by the end of the month. See their Press Release. Also, you can now get some Scotch Barrel Wake Up Dead Imperial Stout for a limited time now on tap in their tasting room. Located at: 1265 Boston Avenue, Longmont, CO. Liquid Mechanics Brewing Company tapped their Amber Altbier last night and is back on tap. They've got 15 beers on tap total. Food truck tonight is from 7 West Pizza. Located at: 297 N US Hwy 287, Lafayette, CO.
Powder Keg Brewing Company is hosting another TNT (Tuesday Night Talk) tonight with the topic: "How Beer Explains the World". The guest speaker is Bart Watson, Chief Economist at the Brewers Association. Grab a beer and listen in. The talk runs from 7pm to 9pm. Located at: 101 2nd Avenue, Niwot, CO.
SKEYE Brewing has brought back a SMASH beer (single malt and single hop). This time around they made a brew with Vienna malt and Mosaic hops. Stop in and try one. Located at: 900 S Hover St, Ste D, Longmont, CO. The Post Brewing Company now offers Crowlers (32oz cans) of freshly canned beer in their taproom. Ask for your favorite beer in a crowler (subject to availability of course). Located at: 105 W Emma Street, Lafayette, CO. Twisted Pine Brewing Company is throwing an impromptu "Pints with a Purpose" event this Thursday, June 23rd in the taproom. $1 from every pint sold that day will go to Orlando victims and their families. More info at: gofundme.com/PulseVictimsFund - donate $1 and receive a pint, donate $10 or more and get a t-shirt. Located at: 3201 Walnut Street, Boulder, CO.
Wibby Brewing has a beer special for Bike To Work Day tomorrow. Stop in on your way home and get a 16oz craft lager for the price of a 12oz pour. Just bring in your helmet and tell 'em you rode to work that day. Located at: 209 Emery Street, Longmont, CO.
Wild Woods Brewery will release a Sagebrush Wheat beer this Thursday, June 23rd in both draft and 22oz bombers. There's just a hint of sage in that brew and adds a nice touch to this wheat beer. Meanwhile, stop in tonight for $1 off pints of their year round beers all night. And Wednesday night is $15 pitchers night. Located at: 5460 Conestoga Court, Boulder, CO.
1933 Brewing Company will be hosting a refreshment station for Bike To Work Day on Wednesday, June 22nd from 6:30am to 9:30am on Mason Street outside of Recycled Cycles. They'll be providing cyclists waffles, coffee and even some samples of their tasty beer (yup A.M. beer). Later, after 6pm you can participate in the Delibeeration: Healthcare event at the brewery. Get info packets early so you can come prepared to talk Healthcare. If you do, you'll get $1 off pints for joining in. They'll also be releasing their Grapefruit IPA that day. Located at: 4025 S Mason Street, Fort Collins, CO.
Big Thompson Brewery hosts Geeks Who Drink Trivia every Monday starting at 7pm. Bring some friends and compete as a team. This week's theme is "Pretentious, Much?". Get your table early. Also, keep in mind for next Monday and every Monday where you get 50% OFF all growler fills! Located at: 114 E 15th Street, Loveland, CO.
Black Bottle Brewery plans to celebrate Shark Week big time next week. They'll be offering up food and drink specials all next week. They'll feature shark movies and shows all week long. Stop in this week for Fort Collins Beer Week specials too. Located at: 1611 S College Ave, Ste 1609, Fort Collins, CO.
Fort Collins Brewery wants you to help them raise awareness of the global water crisis. They're helping Water Mission with support for them to help design, build and implement safe water, sanitation and hygiene (WASH) solutions for people in developing countries and disaster area. How can you help? Purchase any of FCB beer in cans and post your summer adventure photos with FCB cans on Facebook, Twitter, or Instagram with hashtag #WhereCanFCBTakeYou. The more you share, the more they will donate to Water Mission. FCB is located at: 1020 E Lincoln Avenue, Fort Collins, CO.
Funkwerks now offers 8-packs of their Hibiscus Provincial for sale in the taproom - just in time for Double Stamp Tuesday. The first 6 people to buy one also get a bottle pour of Hibiscus Provincial for free! Hurry in! Located at: 1900 E Lincoln Ave, Unit B, Fort Collins, CO. Horse & Dragon Brewing Company will be hosting a refreshment station for Bike To Work Day tomorrow at Lemay & Poudre River Trail and they'll be bringing breakfast burritos from Consuelo's. Then be sure to bike in to H&D after work as well for a brew and cool off. Located at: 124 Racquette Drive, Fort Collins, CO.
Jessup Farm Barrel House has a Tuesday deal for folks in the Service Industry - they get $2 pints tonight and every Tuesday! Located at: 1921 Jessup Drive, Fort Collins, CO.
Loveland Aleworks has a special for T-shirt Tuesday. Buy any Loveland Aleworks apparent and get a free pint. If you wear your shirt to the brewery you'll get $1 off your pint. Located at: 118 W 4th Street, Loveland, CO.
McClellan's Brewing Company has a special set up for tomorrow's Bike To Work Day starting at 11am. Ride your bike in and they'll give you a spicy elk brat and a cask pint for $8. Ride safe! Located at: 1035 S Taft Hill Road, Fort Collins, CO.
Odell Brewing Company is now offering their new Drumroll American Pale Ale in canned 12-packs and on draft. It's described as a bold, juicy, citrus-inspired and tropically hop forward APA with flavors of pineapple, orange, mango, and grapefruit. Also available in cans are their: 90 Shilling, Odell IPA, St. Lupulin Extra Pale Ale and Loose Leaf Session Ale. Take some with you on your next hike. Also, tomorrow, June 22nd for Bike to Work day - ride your bike to the taproom and you'll receive one free can of beer from Odell! Located at: 800 E Lincoln Avenue, Fort Collins, CO.
Old Colorado Brewing Company is tapping a new limited edition beer today to celebrate the start of Summer. Stop in and try their Coco Whiskey Sour beer. Enjoy one out on their patio. Located at 8121 S 1st Street, Wellington, CO.
Pateros Creek Brewing Company will offer a special on their Cache la Porter Ice Cream floats on Wednesday, June 22nd. Stop in that day and get one for $2 off in the taproom. Located at: 242 N College Avenue, Fort Collins, CO.
PinBall Jones is hosting a special Fort Collins Beer Week event tonight - it's the Arcade Tap Slam. Many of the local FoCo brewers will be on hand taking over the place tonight from 7pm to 10pm and will be offering up lots of fun and prizes/swag. Breweries include: New Belgium, Snowbank, Pateros Creek, Black Bottle, Horse & Dragon, and Funkwerks. Plus a lot of their beers will be on tap at PinBall Jones. Some of the pinball machines will be set to FREE PLAY for the 3 hour event. 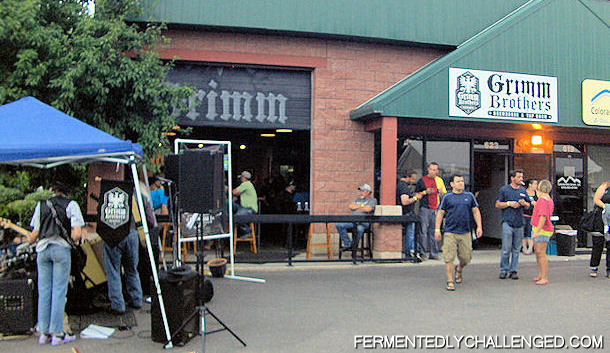 Come on down (below street level) at: 107 Linden Street, Fort Collins, CO.
Rally King Brewing is giving you a free beer tomorrow for Bike To Work Day on your way home from work, that is if you ride your bike there. Offer good on 1st beer only. Located at: 1624 S Lemay Avenue, Unit 4, Fort Collins, CO.
Rock Cut Brewing Company has an old favorite beer back on tap today - their Steamy Blonde! No trivia tonight - they're taking a break until the Fall. A beer will help lessen the impact of this news. Located at: 390 W Riverside Drive, Estes Park, CO.
Verboten Brewing & Barrel Project - Just released yesterday - "In Love with Summer", a strawberry rhubarb wheat beer. This is a summer seasonal. Available on tap and in 22oz bottles. Located at: 127 E 5th Street, Loveland, CO.
Brix Taphouse & Brewery has a special Tuesday Pint Night Line-up featuring beer from Funkwerks tonight from 7-9pm. Also, Tuesdays in June are Customer Appreciate Days. Get $2 off beers from 2pm to 5pm and $1 off beers from 5pm to 10pm. Just another reason to get down there early. Located at: 813 8th Street, Greeley, CO. Broken Plow Brewery will be hosting a Trivia Reggae Night Potluck on Wednesday, June 22nd starting at 7pm. Break out your colorful tie dye shirt, bring a potluck dish to share, grab a beer and join in some fun team trivia with Quizmaster Trivia. A main dish will be provided so bring some sides! Located at: 4731 W 10th Street, Unit G, Greeley, CO.
Echo Brewing Company has a deal going on every Wednesday - get a flatbread Pizza and a Pint for $8. Specialty beer size may vary. Located at: 5969 Iris Parkway, Frederick, CO.
High Hops Brewery will tap a special firkin beer this Wednesday, June 22nd at 5:00pm. This week's firkin is a Stardust Pale Ale, made with Galaxy, Aurora, and Falconer's Flight hops. Located at: 6461 Hwy 392, Windsor, CO.
Hunter's Moon Meadery offers tastings and tours of their mead production facility by appointment only. If you'd like to learn how mead is made, check out some active bee colonies and try some tasty meads call (970) 302-3183 and schedule your next visit. Located in Severance, CO by appt. only. WeldWerks Brewing Company wants to you join in for FREE WINGS from Wing Shack tonight at 6pm as part of their "Brews & Bites Tuesday" special. The wings are available for limited time so get there early if you want some. Might I suggest pairing it with Juicy Bits IPA? Mmmm. Located at: 508 8th Avenue, Greeley, CO.
Hops & Harley - The 4th annual Hops & Harley event happens this Saturday, June 25th from 11am to 6pm in Fickel Park in downtown Berthoud, CO. The dog friendly community event benefits National Mill Dog Rescue and features craft beer, live music feat Western Skyline and Daniella Katzir Band, food trucks, the Brewery Dogs Beer Tasting, vendors, kids activities, dog agility course, and more! Hops and Harley is FREE to attend. Dogs are welcome on a leash. Feel free to bring a chair or picnic blanket. Don’t forget your sunscreen! Beers available from several NoCo breweries. Hosted by City Star Brewing. Farmers Market on site too! Live music, food and more. Get info at the Official Website. Brews and Bites Pairing - enjoy some food and craft beer at The Governor's Mansion in Denver this Saturday, June 25th from 6pm to 8:30pm. There will be over 15 food & beer pairings available. Your ticket gets you a commemorative tulip glass. Live music and more. Several NoCo breweries will be pouring their beers there including High Hops Brewery. Tickets are $75 and are available online. 2nd Annual Leadville BBQ & Brew Festival is this weekend up in Leadville, CO - June 24th and 25th. Enjoy tasty BBQ from over 29 vendors. Festival opens at 10am Friday and live music kicks off at 12pm. Festival lasts til 9pm on Friday. Saturday hours 10am to 5pm. It's one of the highest beer festivals in Colorado at 10, 152 feet. Festival located along Harrison Avenue between Third Street and Eighth Street. More info at www.leadvillebbqandbrewfest.com. Gnarly Barley Brew Festival - tickets are on sale now for the 8th Annual Gnarly Barley Brew Festival in Loveland, CO set for Saturday, August 6th at 1pm on the grounds of the Budweiser Events Center / Larimer County Fair. Featuring beers from all over Northern Colorado. Tickets are $21 each or $18 each bought in a 4-pack and includes sampling mug and 10 sampling tokens. Additional tokens for sale for $1 each. Special VIP tickets going fast at $60 and will include a special mug and unlimited 4oz samples and early (12:30pm) access to the fest and a tent with food and specialty beers, a t-shirt and a pint glass too. Info at www.gnarlybarleybrewfest.com.